From its origins in salons back in 1974, TRESemmé has always been driven by a simple truth; every woman deserves to look fabulous, like she may have just stepped out of a salon. Used by top hair stylists all over the world, TRESemmé is dedicated to creating salon-inspired, products to help women create their own style and get salon like gorgeous hair at home. TRESemmé understands women’s intrinsic desire for salon gorgeous hair at home. Especially designed for women seeking healthy looking hair and a sleek and shiny style, new TRESemmé Keratin Smooth transforms your hair to be smoother and easier to style. Infused with Keratin it rescues hair from the brink of unruly despair. Containing lower sulphates compared to other TRESemmé products, TRESemmé Keratin Smooth Shampoo leaves hair clean, shiny and manageable. The TRESemmé Keratin Smooth Conditioner helps nourish each strand to leave hair gorgeously straighter and shinier than before. In comparison to other non-conditioning shampoos, TRESemmé Keratin Smooth controls frizz for up to 48 hours and transform hair to be shinier and more manageable. As the brand ambassador of TRESemmé, acclaimed model turned actor Diana Penty shared how TRESemmé Keratin Smooth is the perfect hair solution for her. “When I was approached by TRESemmé to partner with the brand, I was sure that I would only endorse TRESemmé if I was convinced - The brand now has a new addition to its long list of fans! 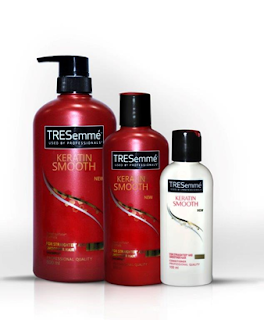 For me, the TRESemmé Keratin Smooth range worked perfectly. I love my straight hair; and therefore frizz can be an absolute nightmare. TRESemmé Keratin Smooth is a quick and easy solution to achieving salon gorgeous hair no matter your hair type."